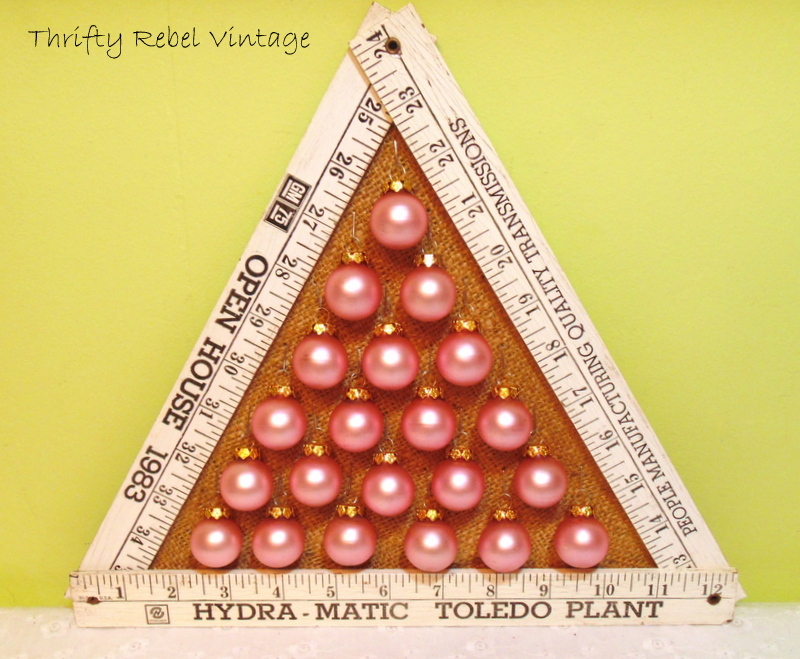 I love to make Christmas wall decor out of repurposed items, and today I’m sharing my folding ruler Christmas tree. 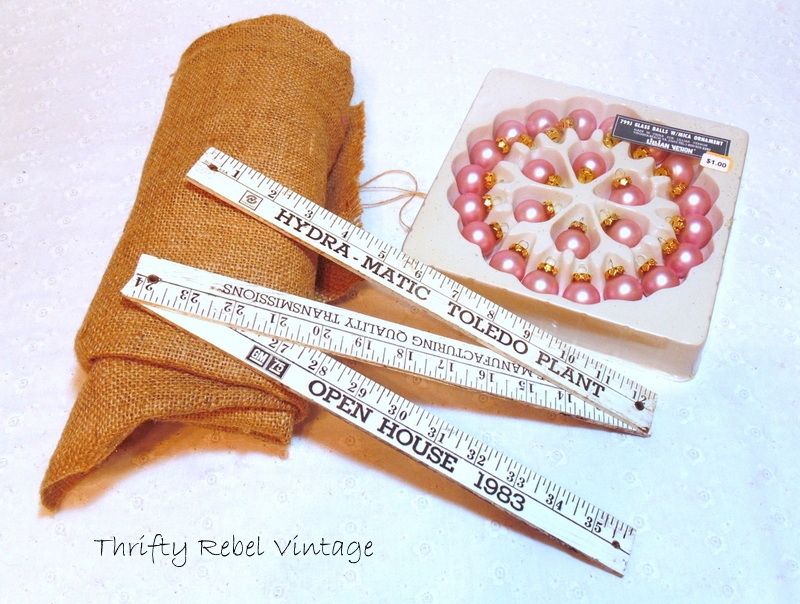 A little while ago a reader who has become a good friend, Dona, sent me a few items that were perfect for repurposing projects. Thanks so much Dona! I love them all! 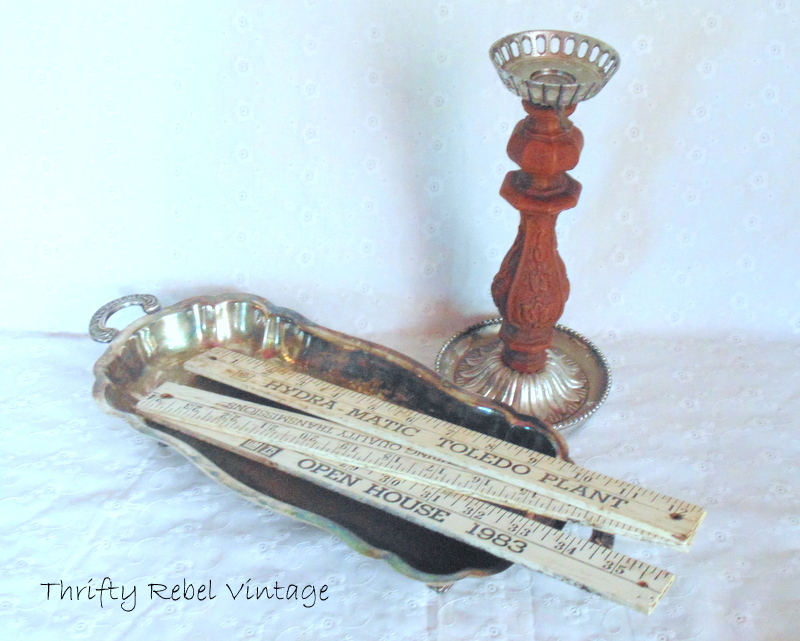 A wooden folding ruler, a very unusual and interesting candle holder thingy, and a lovely silver plate tray. As soon as I saw the ruler a couple of ideas sprung to mind. Since Christmas was coming up I decided to go with a Christmas project. Since the ruler had three sections it seemed perfect for a tree. 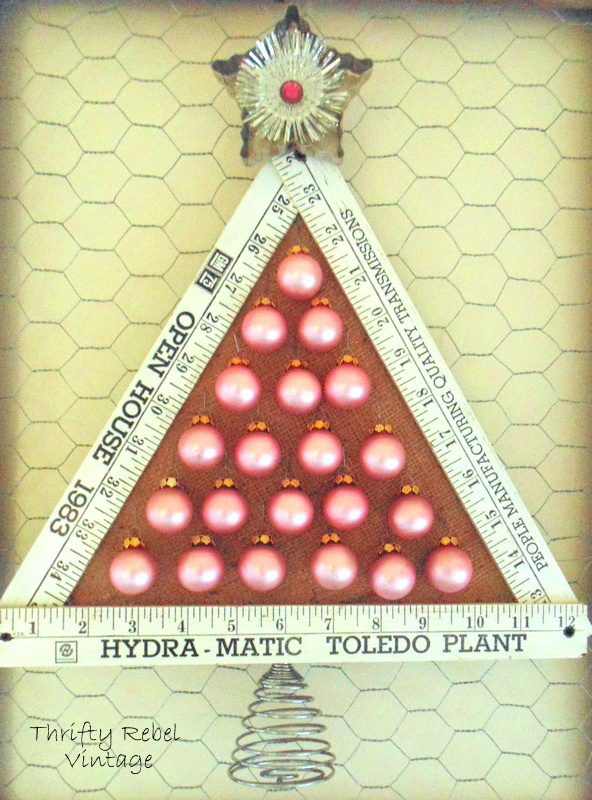 You may remember that last year I had this Vintage Christmas Ornament Tree on the wall in the master bedroom. 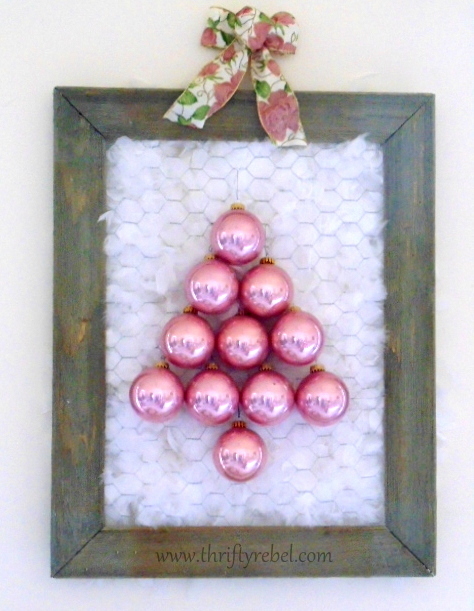 Since those vintage pink glass balls will be on my living room tree this year I decided to make a new tree for the barn board and chicken wire frame. 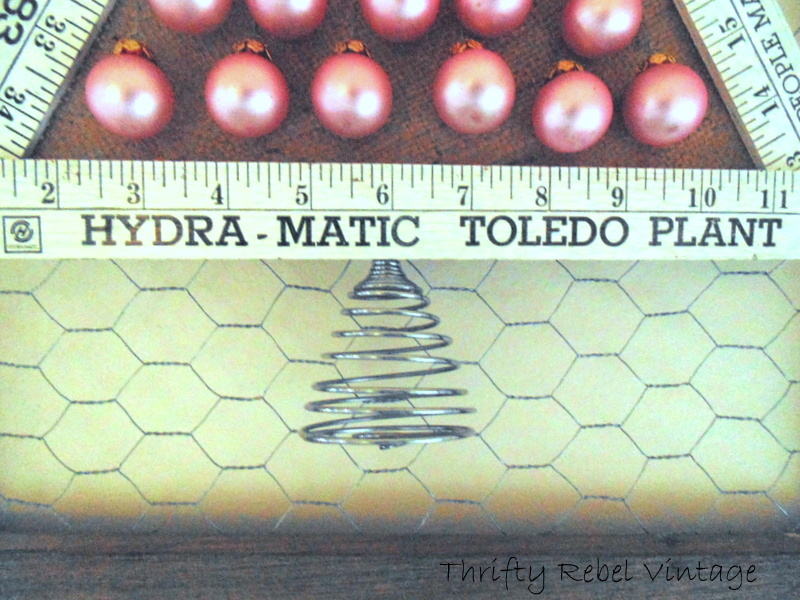 To put together this folding ruler Christmas tree I just needed a few things. I found some small pink glass ornaments for $1 just this week, and they’re the perfect size for this little tree. In my world pink and natural burlap are made for each other. So I rooted through my stash to find burlap that I thrifted a while back for $1. Stuff that I put away is sometimes never found again, lol, but this time it only took me about 10 minutes to discover my burlap’s safe place. 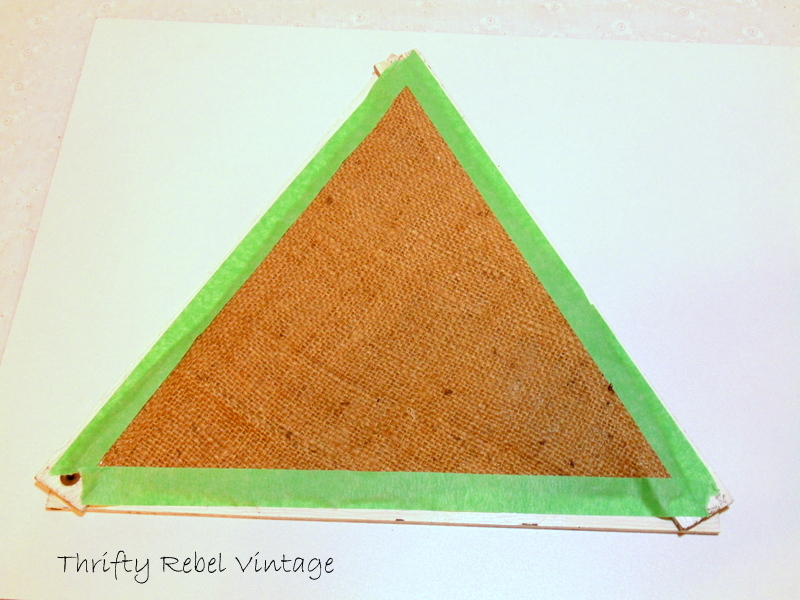 I marked the burlap, around the tree frame with a sharpie. 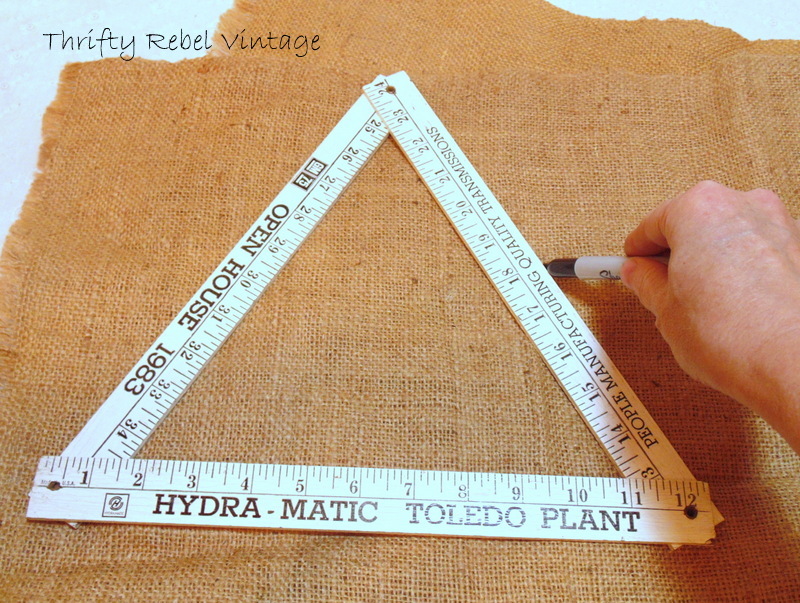 Then I cut about 1/2″ inside the sharpie lines, and attached the burlap to the back of the ruler with painter’ s tape. You can use whatever tape you have on hand, or even a glue gun if you like, but I wanted this to be temporary. After Christmas I can easily take this apart and repurpose the ruler in another way if I like. 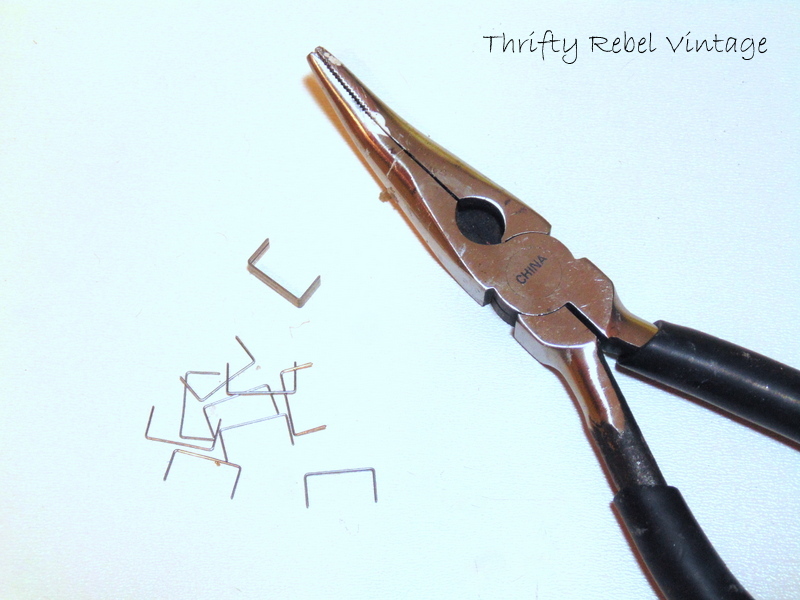 I needed some very small hangers so I separated some regular staples with pliers. I bent one end of a staple to hold the ornament. Then I poked the other end through the burlap and bent it down on the back of the burlap so it would hang nicely and not fall off. From a distance you can barely see the staples because they’re so thin. For the star I used a vintage cookie cutter. I glued a pink rhinestone into the middle of a vintage silver light reflector. Then I put the light reflectors inside the cookie cutter using double sided tape. Then I needed something to use for the tree trunk. I sat for a while and thought and thought, but couldn’t come up with anything.. When this happens I usually just start looking through my stashes to see what I can find. Lo and behold I found this vintage spiral egg beater. Perfect! I just hung it on the chicken wire behind the tree using a wire ornament hanger. The tree and cookie cutter are hanging the same way. Thanks so much again Dona for the fabulous folding ruler. I love it! 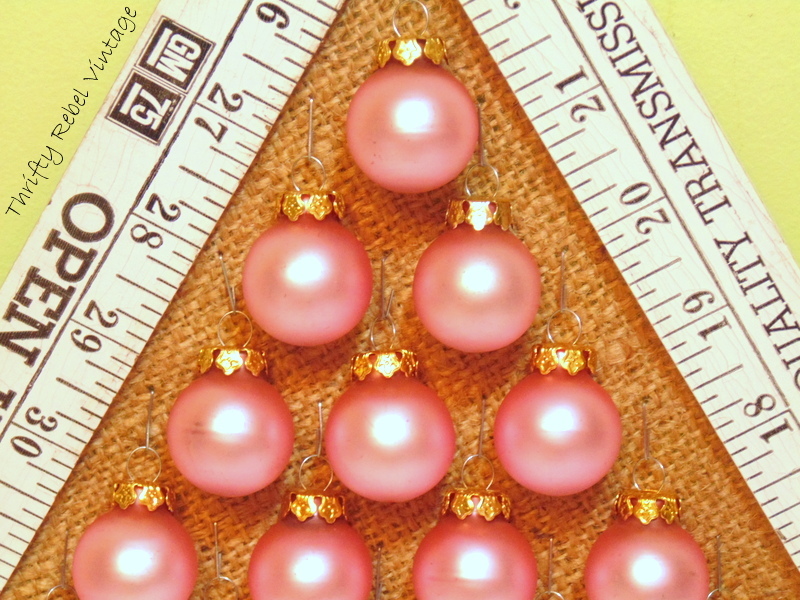 Have you made your first Christmas project yet? Soooo cute. Tuula you are so creative. Love this. Thanks so much Kris! Can you believe Christmas is less than 6 weeks away? Yikes! That’s so sweet Patricia! What a wonderful keepsake of your dad. I’m so happy I brought back a nice memory for you. Thanks so much for sharing that with me. Very, very cute. I love all your pink. Thanks Tina! Christmas is going to be very pink this year. How creative and I love that you can reuse everything if you want to. I tend to be tired of something the next year!! I made my first Christmas decoration a couple months ago….the tree on the aqua board with the metal pieces I found. I still love it! Thanks AnnMarie! I remember your metal piece tree. I loved it! I do reuse some things every year, but I also need to repurpose new things, or old things in a new way. It keeps things interesting and fun. OK that is just adorable Tuula. How creative you are and what a wonderful friend you have. Thanks Karen! 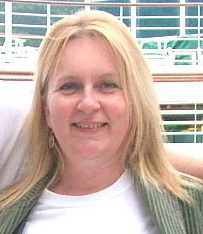 Isn’t it amazing how many fabulous people we’ve met through blogging. It’s makes it so worthwhile. Cute, cute, cute! Just love the way your mind works Tuula! Thanks Cecilia! It does work in mysterious ways sometimes. lol. I know you can relate to that. I love the tree! Pinning. Thanks so much Virginia! I appreciate the pin! Eek!!! I LOVE it! So creative and cute! Thank you for sharing! Thank you so much April! I’m excited that you’re excited about it. Make me so happy! Such a fun Christmas tree! Love the vintage details. Thanks Tara! 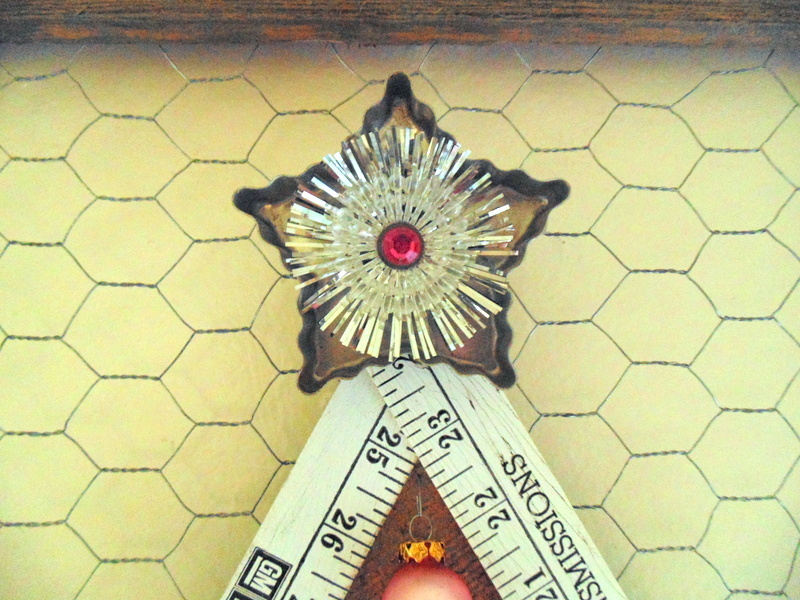 I love nothing better than making something out of repurposed vintage bits and pieces. It’s such fun for me. This is so darn cute! How clever of you to use staples to attach the ornaments to the burlap. Love the addition of the folding ruler and the cookie cutter. I just used a cookie cutter as a top for a tree. I knew I was saving them for a reason. Great job! Thanks Betsy! I think all of us repurposers have a vintage cookie cutter stash. They can be reused in so many ways, and you never know when we might get the urge to bake cookies. lol. Love this… pink is my go to.. good choice. Thanks so much! Pink is my go to too. Cute Christmas tree! Clever, clever. I made my first Christmas decoration. I strung ornaments on a piece of string for garland. Not one of your ingenious ideas, nothing complicated, but looks great. 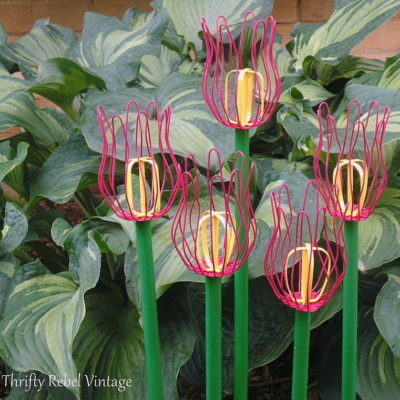 I used cheap plastic bulbs. Some are from 2nd hand stores, some from dollar stores and Kmart, etc. Thanks Sheila! Your garland sounds very pretty, and sound like it was thrifty too. That makes it even better. I sometimes think the simplest projects are the best. Super cute, Tuula! I just did a ruler/yardstick project this week, myself–must be in the air. What a sweet follower friend to send you all those goodies. 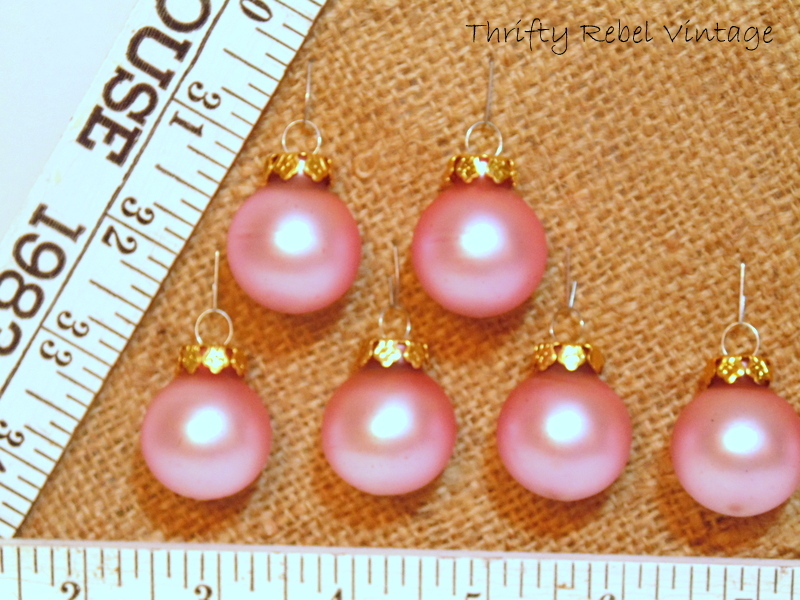 LOVE the pretty pink ornaments. Not a usual color for that size bulb. You lucked out all the way around 🙂 Thanks for linking up your creation at Vintage Charm! Thanks Diana! We do meet the nicest people through out blogs. I’m always on the lookout for pink bulbs. They are hard to find. I love your tree! 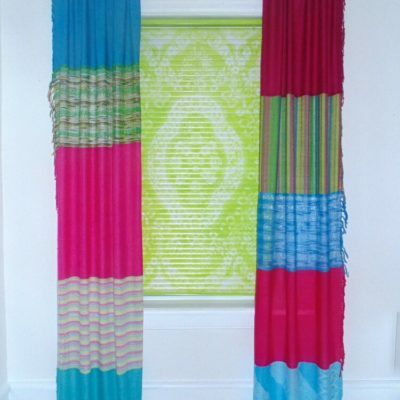 Tuula, always love your creative projects. This is so cute and I love the use of the whisk! Very creative. Thanks for sharing with SYC. Thanks so much Jann! It’s always fun to join the party. 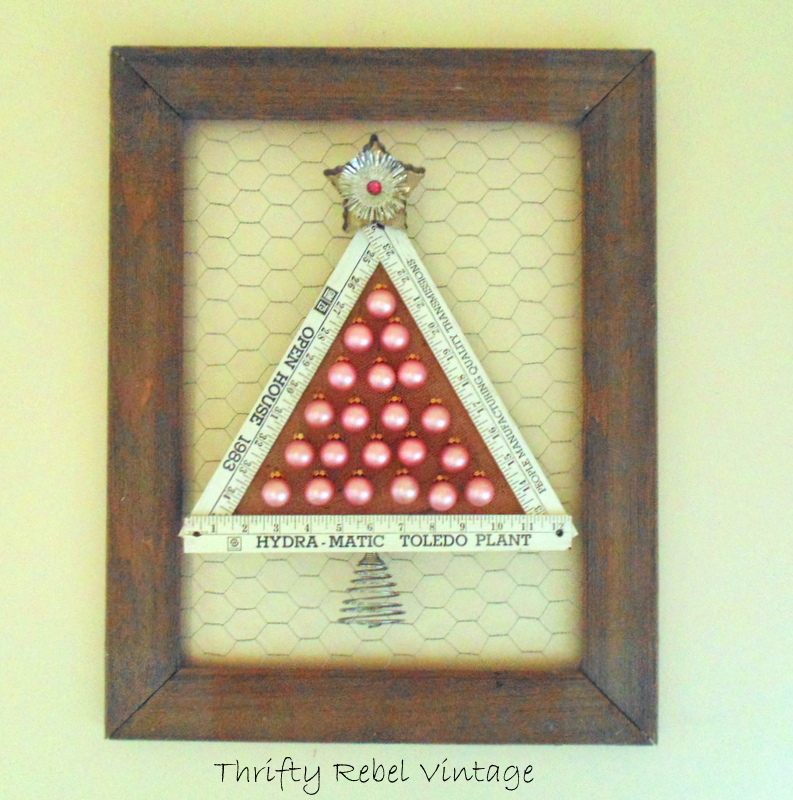 Tuula, so glad to have you share this fun project @A Very Thrifty Christmas! Merry Christmas! Thanks so much Ceclia! Taking part in your party was such fun.